Our seventh day in Sicily was moving day, so we woke up around eight, showered, packed our bags and tidied the apartment, ready to move on to the hostel. Remember a couple of posts back I mentioned the little gelato and pastry shop next to the apartment building? Well, since it was our final morning in that area we decided to give it a go. So, we left our suitcases in the apartment and settled on a table outside the shop. 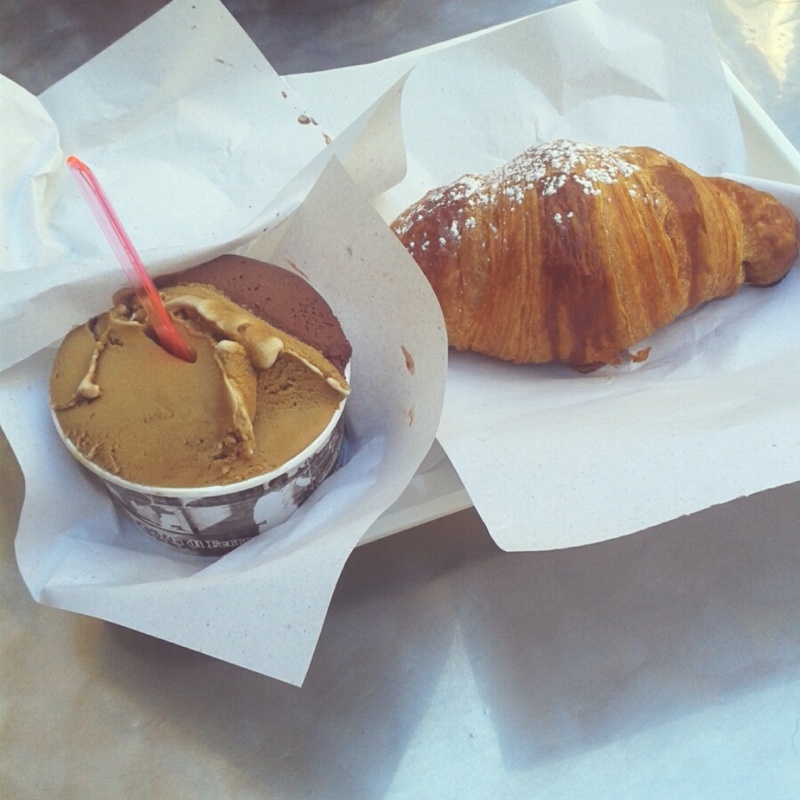 The boy had chocolate gelato, of course I had coffee flavour, we each had a shot of espresso and we shared a croissant. Bellissimo. What's even better is that all of that only cost just over €5. We then went back, picked up our suitcases, said goodbye to our lovely little apartment and walked into the main square to drop our bags off at the hostel. For our last four nights in Sicily, we stayed at 'Ostello degli Elefanti', a wonderful hostel right by the main square. When we booked the hostel through Hostelworld, we made a bit of a mistake and said that we wouldn't be there until mid-afternoon, so when we got to the hostel at around eleven our room wasn't ready yet, which we expected. We were however able to leave our bags behind the desk, and we were very kindly invited to explore the rest of the hostel while we waited. One of the first things that struck me about the hostel was the amazing laid-back, almost bohemian vibe, with slow reggae music drifting through the halls, a record player and a collection of old records for guests to use in the common room, sun and moon ornaments on the walls, incredibly friendly and welcoming staff, and the ceilings, oh the ceilings! The ceilings in the common room and the dorms are painted to look like intricate baroque carvings depicting angels and cherubs and gold detailing around the edges. According to Hostelworld, the hostel is actually built in the music rooms of a 17th century palace, and that definitely shows in the interior architecture. We were also invited to explore the roof terrace, and this ended up being my favourite spot in the hostel. 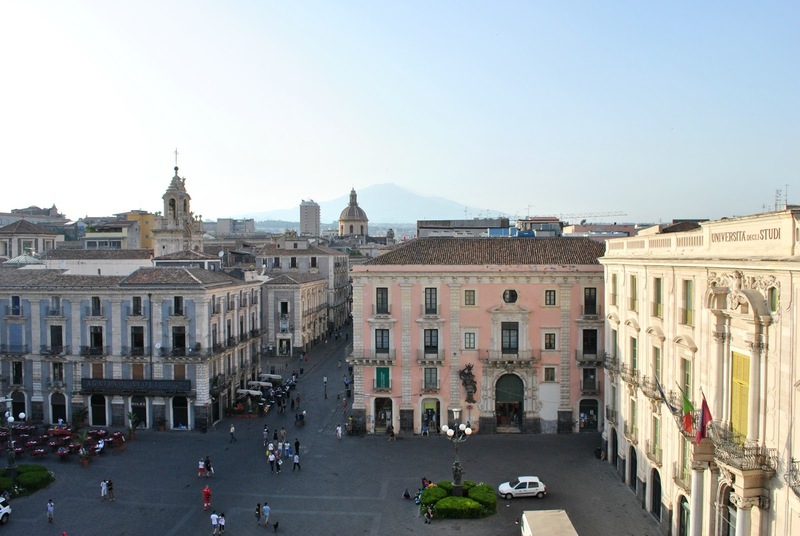 On the terrace, you find yourself looking out over the square, with the most amazing view of Mount Etna. There is a little table up there with a couple of tables so you can sit and enjoy the view of the city, although the walls are thick enough that you can comfortably sit on those, too. Standing there on that roof terrace with the sun shining over us, some fresh air and this outstanding view, I felt so incredibly blessed and grateful to be in this beautiful place. We then went out into the square to grab a drink while we waited for the room, and when we came back we were given the wi-fi password (the wi-fi is available in the common room and is completely free), and we decided to relax in the common room for a while. About an hour after we'd arrived our room, the double bed suite, was ready. We were shown our room and private bathroom, and I couldn't have been more delighted. The room had a high, domed ceiling, tall windowed doors which led out onto the little balcony, a comfortable double bed, a wardrobe, a table and chairs and a fan. The walls, floor and ceiling were all white, and with the huge windows of the doors, which faced towards the square, the room was incredibly light and airy. It was perfect. We were starting to get a bit peckish so we went back to the square to have some lunch, but when we went out most places were shut (lunch is the main meal of the day in Italy, so between around one and four o'clock in the afternoon most places close so that everyone can go home and enjoy a big, beautiful lunch with their family), but we did find a place that was still open that sold small pastries and other snacks, so we grabbed a couple of little pizzas and sat outside to eat them. When we got back to the hostel after lunch we relaxed for a while before getting ready to go out. There was a football match on that night that was being shown in the square across the street from the hostel, and a couple of the restaurants in the square had set tables outside so that people could watch the match while they ate, and as the boy is a big football fan, we decided to go back to 'La Collegiata' so that we could do just that. The boy had steak and salad and I had a salad with lettuce, onion, tomato and a lightly salted cheese, and of course we had some local wine which was delicious as always. We went back to the hostel at around ten and I had a little Skype session with my parents before we settled down for our first night in this beautiful hostel.